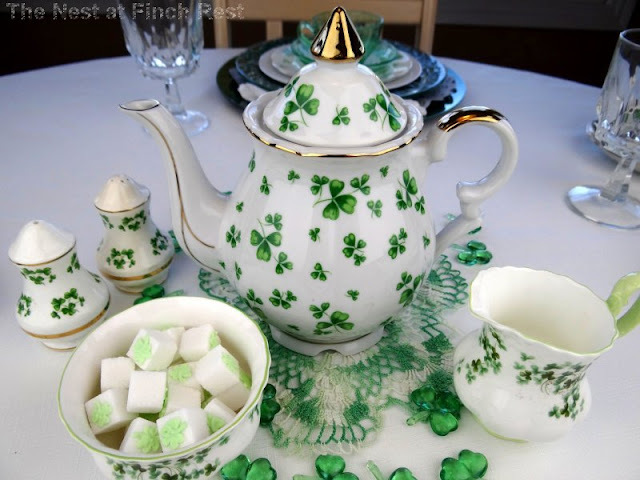 What Shamrock Tea is complete without shamrocks on the sugar cubes? Here's the top one (above) made in Ireland a little closer to show the shamrocks on the inside. I even have two sweet mini shamrock teacups, hostess gifts from friends who came to tea! This is a Lefton teapot. Heading over to A Delightsome Life for A Return to Loveliness! Heading over to Artful Affirmations for Teacup Tuesday! Heading over to Martha's Favorites for Teacup Tuesday! Heading over to Sweetology Teacup Tuesday! Don't forget to join the fun at Cuisine Kathleen's St. Pat's linky party crawl this week, starting tomorrow! absolutely deliteful bits 'o the Irish! I'm celebrating TeaTime in Killarney if you'd like to join us? Wow I love all your teapots and cups! So elegant and pretty! Happy St Patrick's Day! You have quite a collection, Michele! What fun you must have celebrating St. Patty's Day. What a beautiful collection! Happy St. Patrick's day to you! You have a wonderful collation. Now, tell me, did you put the shamrocks on the sugar cubes or did you buy them that way? Inquiring minds want to know. How wonderful to have all of this beautiful shamrock china. Your table is certainly "wearing the green"! These are just gorgeous pieces, Michele! I have that same stand and have my brown and white transferware teacups and saucers on it. Love those sugar cubes and the little glass? shamrocks you have on the table. Great collection! You officially have the best Shamrock china collection. You deserve a button or something! 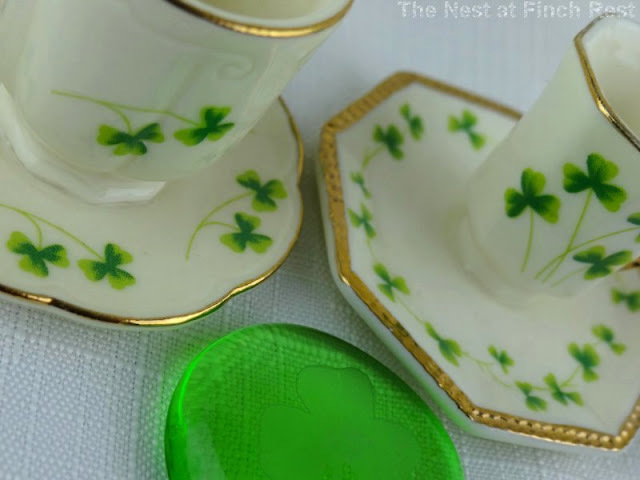 You have a knack for finding the most beautiful shamrock pieces. Amazing. Beautiful pieces, all so pretty! Happy St Patrick's Day! I LOVE all your shamrock china! Your teacups are all so lovely and they look so sweet displayed on the stand. Love the teapots too and your favourite is also my favourite; it's gorgeous! What fun to set the table for tea using these pieces! Looks like you're all set for St. Patricks Day. Thank you, my friend, for sharing with us and joining me for tea. Happy St. Patricks day to you! Thanks for listing all the names of your BEAUTIFUL china. I am seriously coveting each one!! I would use them all year long if I had such a beautiful collection. Thanks again for sharing all your pretties. I love them all!!!!!!!!! You have such a beautiful collection, I am just intrigued! 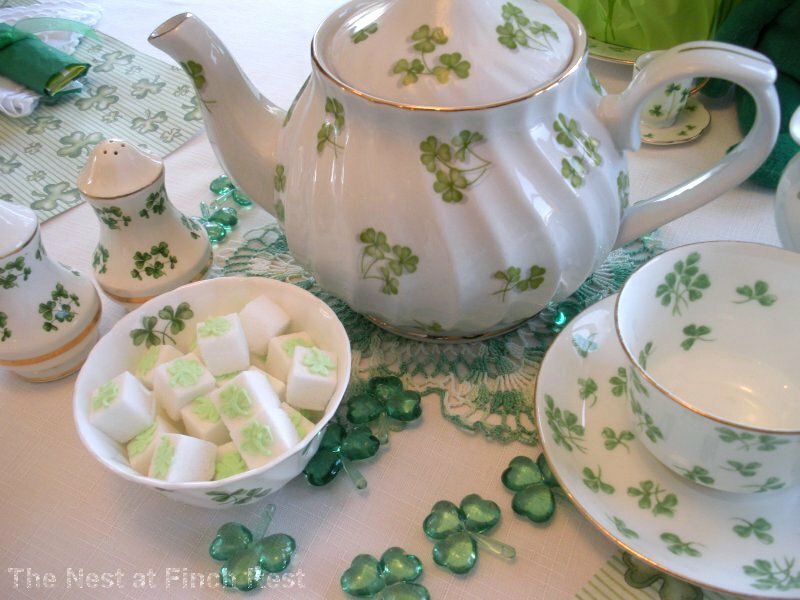 I never imagined there were so many different and lovely patterns of shamrock china. This makes me want some too! I'm just making my rounds...visiting everyone on the linky list....I think I'm #21 on the list...but it's not showing up yet! Thanks for sharing your precious tea with me today. 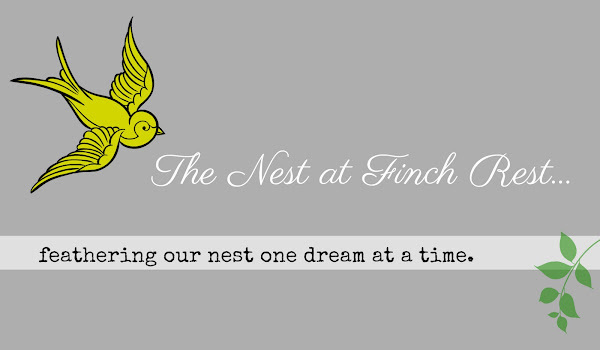 Hope you'll stop by to read my nostalgic post about my love of collecting and using tea cups! Oh, I meant...ALL YOUR TEAPOTS with shemrocks...love them all!! What beautiful china you have. A beautiful post celebrating St. Patricks Day. I'm amazed at all the beautiful Tea items you have and am so glad they found a home that appreciates them! Beautiful collection of tea cups...love all the green and white. Oh my! 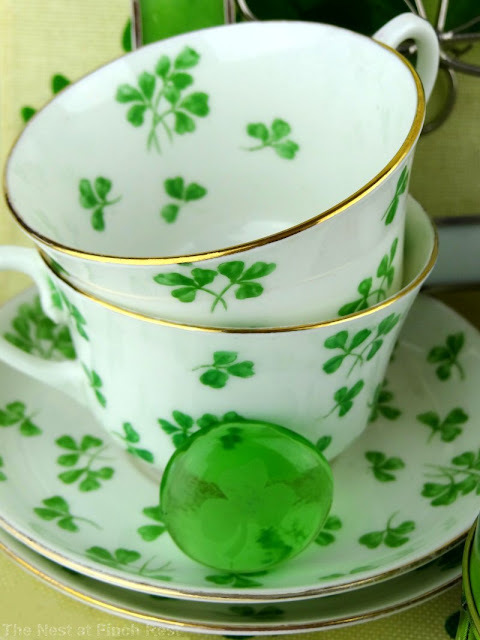 Your shamrock teacup collection is won-der-ful. What a wonderful thing to collect. 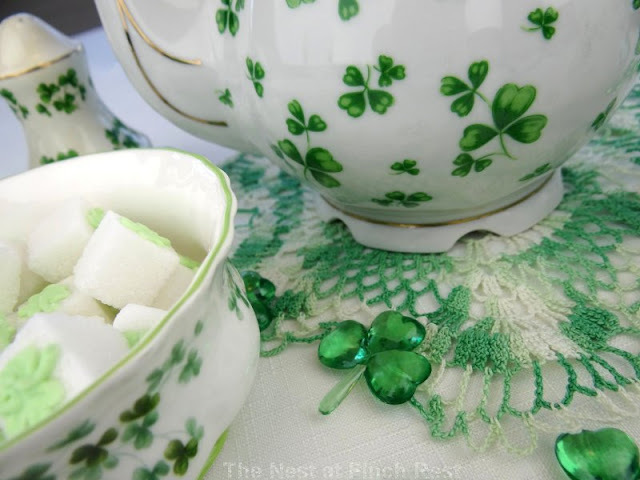 Love the shamrocks on the sugar cubes. Great photos, too. Happy St.Patrick's Day! I am in awe of this wonderful collection of shamrock china. All the teacups, the teapot; and the sugar cubes are so sweet! Did you do the decorating on them? This is such a pretty table!!! 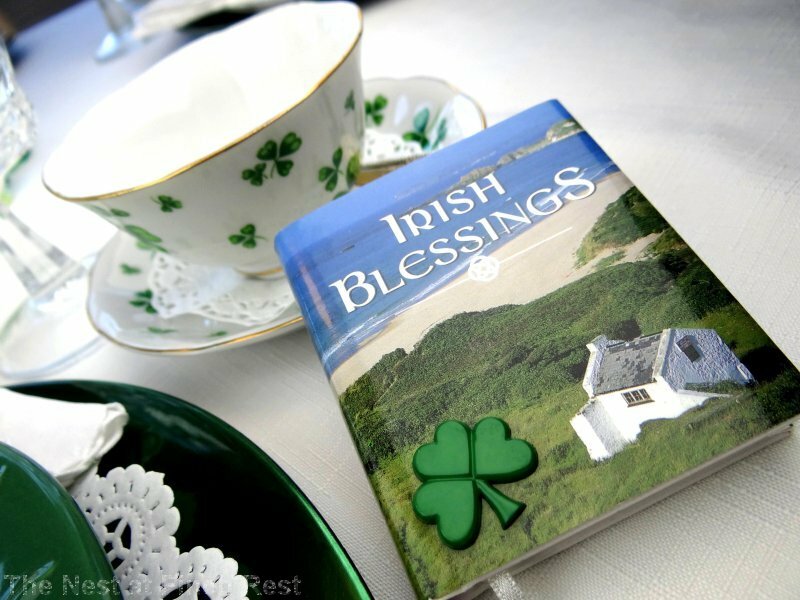 It's so much fun to see everyone's Irish treasures. 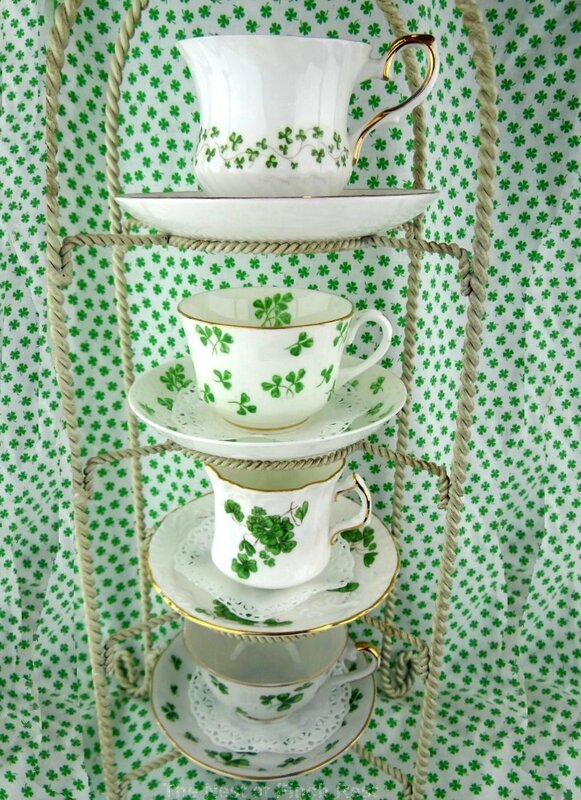 I just love all four of your BEAUTIFUL shamrock teacups and your pretty tea pots, as well. Everything on your table looks great. I love your green and white crocheted doiley, the festive shamrock sugar cubes, and the glass shamrock scatters. I'm so glad you shared this with us. Thanks so much for visiting my blog and for your kind comments. I hope you have a great week! I love all your teapots and cups! So elegant and pretty! Happy St Patrick's Day! I hope you come join my Tablescape and I will follow you back. I enjoyed seeing your shamrock tea cups and saucers. I like the doilies too! What a perfectly Irish post! I loved seeing all the shamrock cups from the different manufacturers. Funny enough, my post today is a Royal Tara too! And as of a few days ago I had never heard of it until I saw my cup in an antique shop. So it was just in time. 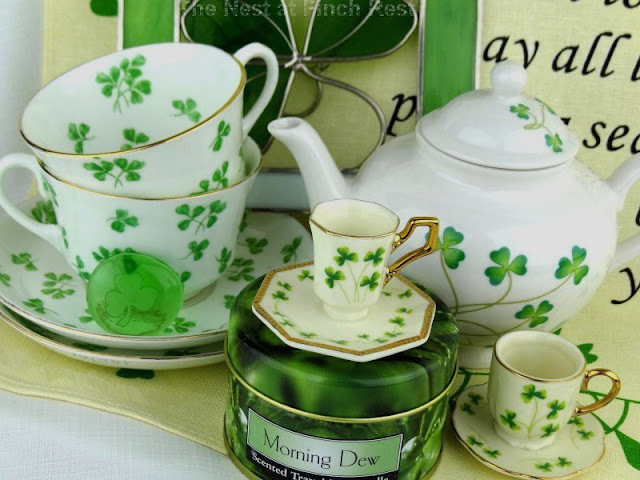 I do love shamrock china! I am always on the look out for it. You have such a beautiful collection, and as someone said, it is amazing they are presented in so many different ways. Thank you for sharing your pics, they are beautiful, and being part of the Blog Crawl! Happy SPD, Mavourneen! 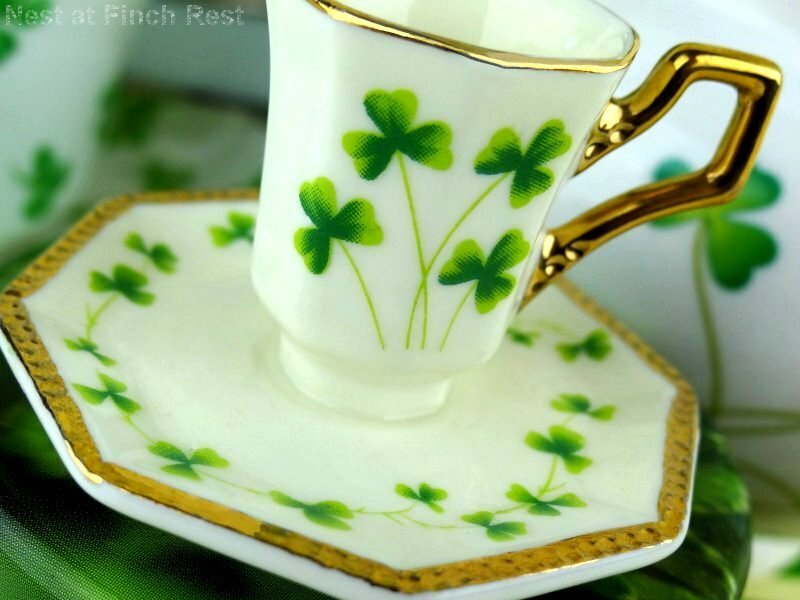 Your collection of shamrock china is just beautiful. I didn't realize there were so many different patterns. 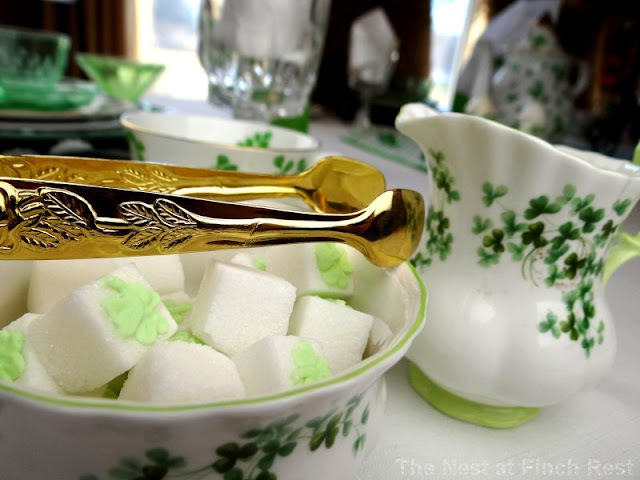 You'll set a lovely tea table for St. Patrick's Day. Happy Saint Patricks day to all!!!!!! 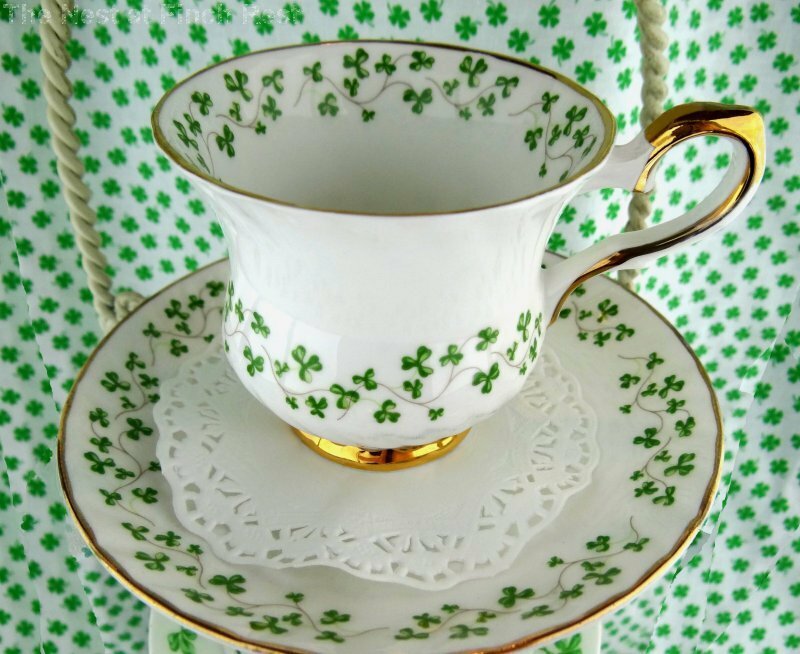 OH how pretty your shamrock china is. I never knew there were so many different patterns! Hello! I love all of your dishes but the little sugar cubes are my favorite thing! Just adorable. Thank you for visiting my blog and leaving such sweet comments. It's very nice to meet you...your blog is lovely as are you. Oh wow! You have such a pretty collection of shamrock teacups, teapots and china. I love how unique each one is but look so great grouped together because they are all shamrocks. The shamrock sugar cubes are just the cutest thing I have ever seen though, where in the world did you ever come across those? Thanks so much for your visit and kind comments. I hope you drop by again anytime! Hi cute lady.....What gorgeous dishes. And what a collection. 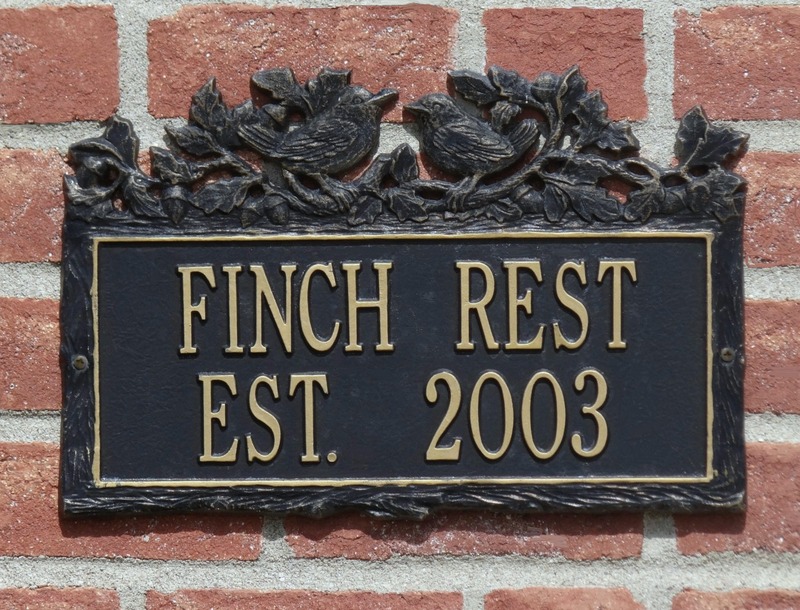 Your luncheon/tea is going to be so very special. I sure hope you're feeling better though. Michele I'm worried about you. I just saw how sick you've been. We just took a spur of the moment trip down here 11 hour drive) to one of our daughters so I've really been out of things. I'm using my husbands lap top right now and it drives me crazy. this little curser does not want to move and its taking me forever to navigate around it. I wish I were there to make you some chicken soup. And here you were able to get a post up as sick as you are. Please don't overdo it and kill yourself off before your party. Please take care of yourself. You are always so sweet to stop at my blog. Thank you, sincerely. I LOVE those shamrock tea cups. I collect dogwood tea cups in green and white (why didn't I use those in my St. Patty's Day mantle?) and love the green and white combination too. Did you make those sugar cubes? I love your attention to detail. Happy St. Patty's Day to you and yours. Wonderful tea party post! YOur tea cups are so lovely on the tiered stand. Erin go Braugh! I love your little shamrock teacups...they are so pretty! Your little sugar cubes are absolutely adorable too!!!! Wow, your collection is awesome!!!!!! Totally just drooled over those teacups and lovely clover designs! All your pieces are fantastic. I just become a follower. I hope you get a chance to see my Shamrock dishes. Happy St. Patty's Day. 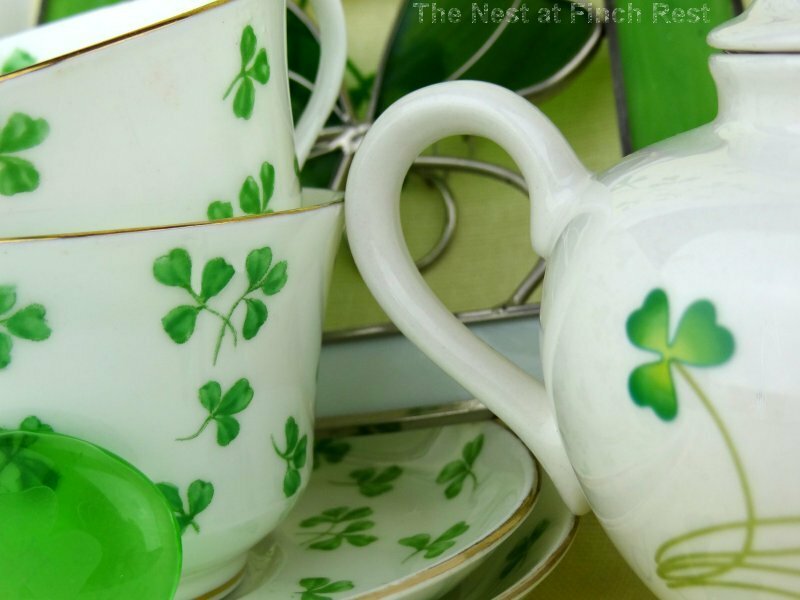 Michele, I am swooning over all your shamrock china!!! What beautiful pieces you have in your collection. Happy St. Paddy's Day!! You have absolutely beautiful china! I'm completely ashamed to have you see what I put on my table... I hope I can have some like yours someday. It's really wonderful. We all started with nothing, trust me - this has been a lifetime collecting.......and I would love to come to your table anytime, ceramic mugs holds tea just as well - actually better even, more and stays hotter longer....but want you to know that it didn't happen overnight and it won't for you, either. Thanks for you post!!!! Your china is exquisite! It is impossible to pick a favorite, so jealous! I crown you QUEEN of Shamrocks!